View Poll Results: enjoyed the broadcast? 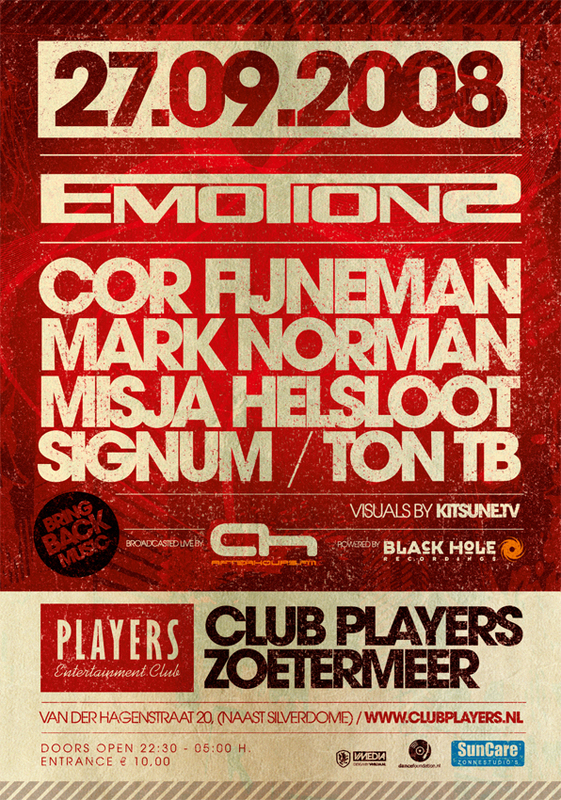 On Saturday September 27th, Club Players in Zoetermeer will be the scene of the first EMOTIONZ! This edition will be the centre stage, presenting an evening full of rocking music, visuals and entertainment at one of the hottest clubs in the Netherlands. At EMOTIONZ the focus will be on an ultimate build-up to a musical climax. A good party lives or dies with the right DJ at the right moment. EMOTIONZ has found a great opener in DJ Ton TB, who is particularly known from the legendary ‘Three Drives’. He is unprecedented in creating an atmosphere for the evening. The attention on DJ Ton TB has been brought back by his latest single ‘Feel the Rhythm’, which can be found on the new ‘In Search of Sunrise, by DJ Tiesto. This edition, DJ Ton TB will show the world why he is still a big name in the dance scene! Next, DJ Cor Fijneman will take the wheels. This all-round DJ will feel the room, and find his own way to raise the temperature. The promo of his latest mysterious release is making its way through the scene. Everyone is playing it and of course it will be played at EMOTIONZ by the man behind it. After DJ Cor Fijneman the time is ripe for Mark Norman. This DJ, with his two successful albums, is found mostly playing abroad. In a relatively short time, DJ Mark Norman has succeeded in creating his own recognizable sound as DJ and producer. His new promo will hit the streets this week and this one promises to be a real club hit again. DJ Mark Norman will spark the party and set fire to the evening! Misja Helsloot, a veteran in the scene, will present his skills next. The founder of his own ‘Create parties’, will use his catchy sounds to raise the party to its climax. And last but not least, Signum will bring this event in their hometown to a dignified close. With all their global hits they’re working hard to finish their first album. At the moment, their final release ‘Royal Flash’, is being hyped by the big Jocks around the world. Supporting the music, the one and only VJ Kitsune will tickle your senses with his amazing visuals. This VJ has been performing numerous times alongside the world famous DJ Tiesto, and this edition of EMOTIONZ promises to be at least as spectacular. Of course there will be a number of acts that will complete the entertainment. These performers have played in the Pussyclub in Berlin, XL in Paris and now they will make their appearance at EMOTIONZ. Finally, the lighting experience will complement the EMOTIONZ experience. So, Saturday September 27th will be another party to look forward to. Not just because of the line-up, but also the attractive entrance fee of € 10 should leave you no choice but to attend this edition of EMOTIONZ. Tickets are only available at the door. Last edited by trancefan0883; Feb 22nd, 2012 at 17:38. OMG! amazing weekend!!!! bolier party + this one!!!!! Ticket contests will be on air soon, so stay tuned to win yourself a ticket to this great event! for saying ''jealous'' i guess it mean that its a shame me and everyone else cant make it to be there but at least we have the broadcast so thats something from anything at all..
will be great offer if i win this - yes again i will probably give it to a member who wants/can go! Last edited by Laan; Sep 5th, 2008 at 14:05. 4 tickets are to be WON! 4 tickets , all as single ones ? or all 4 together ? All times are GMT +2. The time now is 10:08.